The Mini is most portable model in the award-winning Loudbox series so far, packing a whopping 60 watts of clean acoustic power into its compact and lightweight frame, with the tonal quality we have all come to expect from the worlds leading innovator in acoustic sound. Featuring separate instrument and vocal channels with master volume, the Loudbox Mini also has built in digital reverb and chorus, auxilary inputs for cd/mp3 players and balanced XLR D.I. output. The instrument channel also features a feedback busting phase switch. 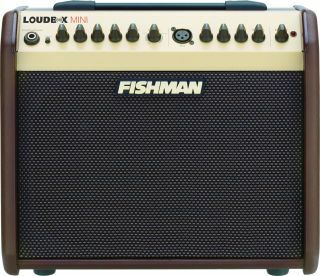 Priced with an RRP of just £449, the Loudbox Mini PRO-LBX-500 looks set to become another Fishman classic.